Though I love rice, it didn't appear in regular rotation in our diet until we looked to it for economy, nutrition and body building. I lack the knack, the Rice Touch. A product of Russian/German and Swedish/Yankee Puritan ancestry, rice rarely featured in my families' menus and though my mother attempted to produce "Chinese Restaurant" rice at my request, it was never her signature dish. Despite various methods promising consistent perfection, I often wound up with a gooey mass. 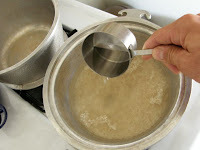 Wash rice thoroughly in warm water, washing several times until water is clear. Drain, place in unit, add cold water and salt. Start over medium heat until boiling point is reached. 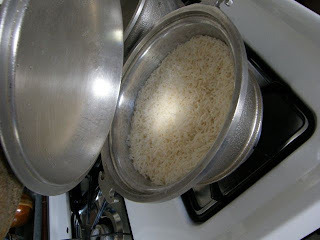 Cover, reduce heat to very low until rice kernels are tender. (Do not stir.) 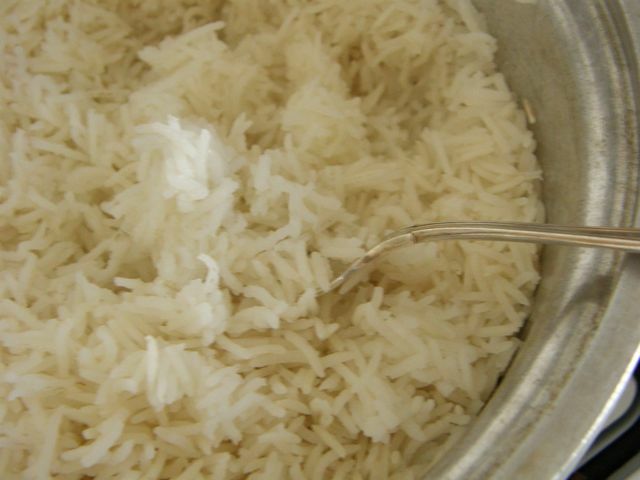 Rice may be unmolded from unit by running a knife blade around edge. (Every grain will be tender and separate—no sticking—no soaking required—no waste of rice.) Serve it buttered as a substitute for potatoes—as cereal—as an accompaniment for chop suey or shrimp creole—or use as a basis for nourishing desserts. 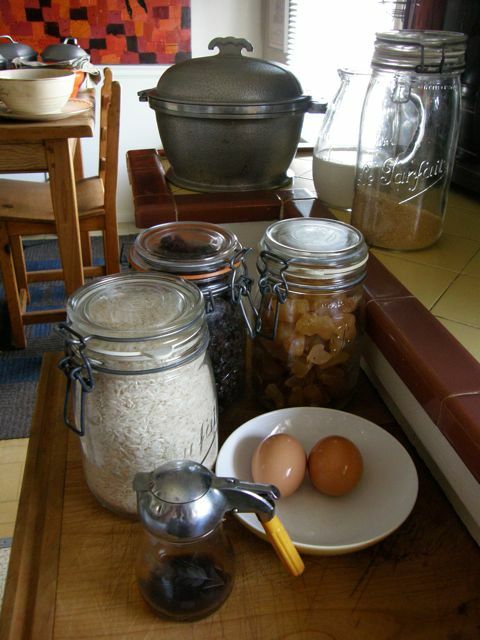 Companion Recipe: Rice Pudding—What better way to use up two cups of leftover cooked rice? Note: While the Guardian Service Tested Recipes cookbook does have a recipe for Rice Pudding (which I'll experiment with and blog about soon), it calls for a cup of uncooked rice... and we had plenty of leftover cooked rice. (Also Note: 1 cup of uncooked rice yields 3 cups cooked rice). NOTE: Add vanilla, if desired. 1/2 cup seedless raisins (or chopped dates—a handful of chopped candied ginger added to the mix is especially good). 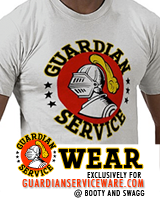 Pour mixture into the Guardian Service Casserole Unit and set into Tureen Unit over medium flame and cover. Bake for 40 to 50 minutes, until sides begin to brown. 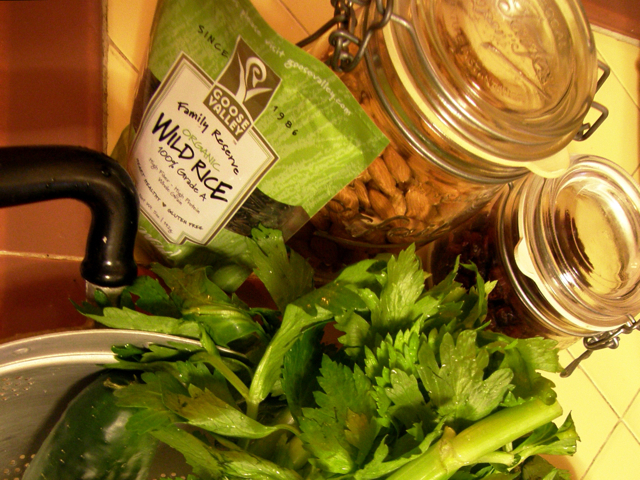 *UPDATE: Wild Rice. 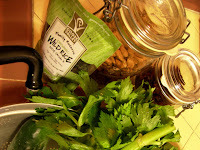 Soon after posting this blog, we received an email from Goose Valley, a grower of certified organic and natural wild rice in the Cascade Mountains in Shasta County, California. The farm and ranch at Goose Valley work in tandem, reducing the amount of external inputs each operation requires in an effort to farm with a minimum impact on the environment. Nicole, in their Boston Sales Office, asked if we'd like to try some of their wild rice and sent a trio of their packaged rices. 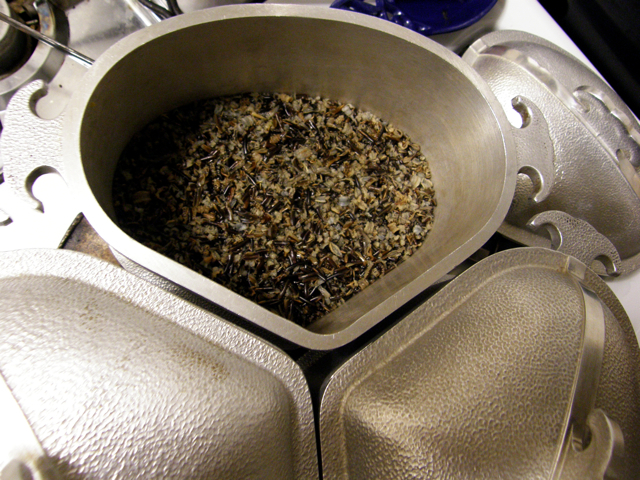 We started with their spectacular Organic Wild Rice, which has a rich, nutty flavor and couldn't be easier to prepare the Guardian Service way (we used an Economy Trio cooker and prepared vegetables and chicken in the other two cookers, all over one flame for added fuel economy). Simply add 1 cup wild rice to 3 cups water or stock, bring to boil, cover and simmer on low heat for almost an hour, until the kernels become fluffy and tender. 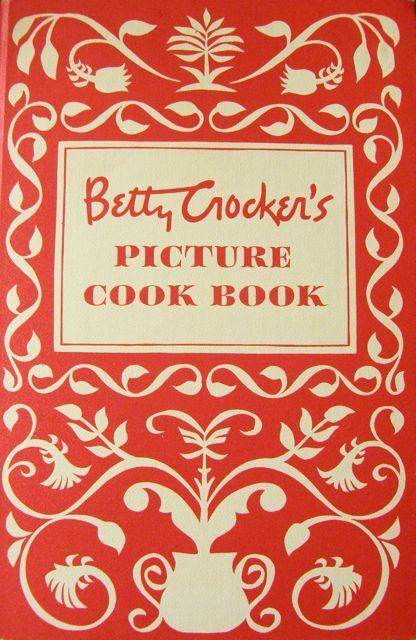 There is no dish so beloved in the vast canon of American cookery as Chicken Pot Pie. Every American region has a version, all of them essentially local versions of English and German meat pies of the eighteenth century. The dish is fantastically versatile, yet it makes everyone think of Mom and home. It must rank third, after hamburgers and hot dogs, among our national favorites, and far pre-dates either of them. It certainly was a favorite in the Martin household. My mom Kathi’s recipe is, to me, the gold standard. The crust is exactly what you want it to be: a crisp, crumbly shell that breaks into golden flakes in the gooey ooze of the rich white sauce. Two days in the fridge improves it; eat it cold for breakfast with hot sauce drizzled on top, or wrap it in wax paper for a brown-bag lunch. 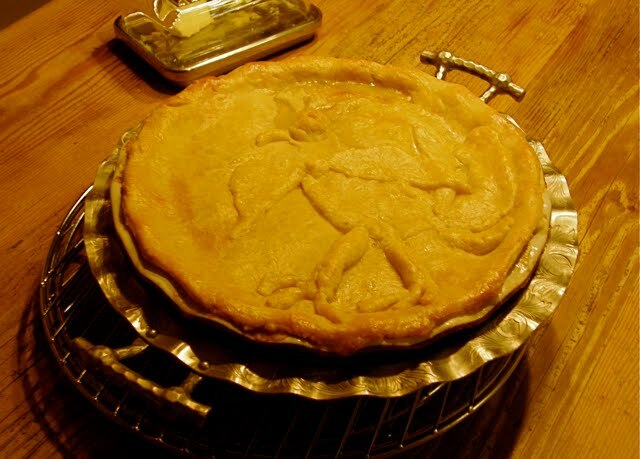 I vary the recipe freely; this pie welcomes leftover vegetables, and is as delicious with nutmeg (New England) or saffron (Pennsylvania) as with paprika and rosemary (Kathi’s choice). I suggest you make this pie only for those you dearly love, folk who deserve a little spoiling. 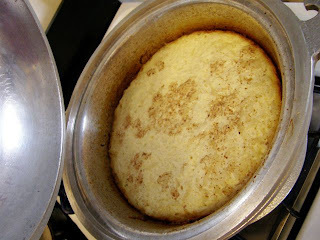 Because it is a steamed pie, it turns out to be the perfect recipe to cook in the Guardian Service Kettle Oven, which yields mouth-watering results. The pre-cooking of the individual ingredients in the Economy Trio "triangle" pots gives exactly the right texture to the meat and the veggies, and cuts down on the baking time, thus reducing the heat in our San Fernando Valley kitchen (as well as our carbon footprint). 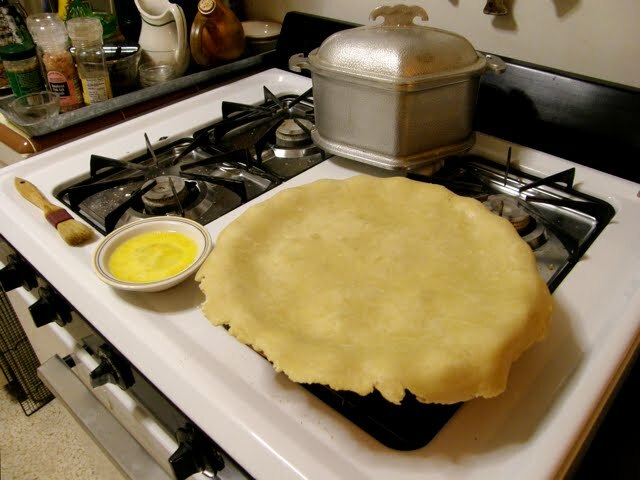 Make the crust first; while it’s chilling, pre-cook the vegetables, the chicken, and the sauce in the three triangle pots, then pour them into the pie plate, cover it with the rolled-out crust, and lower it into the pre-heated kettle-canner. Finish it under the broiler for top-browning, if you wish. Chicken Pot Pie also happens to be spectacularly healthy, with a near perfect ratio of protein to carbs to fats. Served with a green salad or salsa, there is nothing more the body needs. In my benighted twenties I tried obsessively to reduce the fat in this recipe, with more or less miserable results. Now I am older and wiser and see Mom’s wisdom. I use the best butter and cream I can find; you should too. 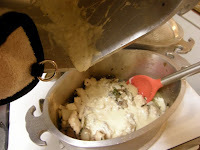 Prepare pastry in bowl, mixing flour and salt, cut butter in to make coarse crumbs. In small bowl, beat together egg and water, add to flour mixture. Mix lightly til soft dough-ball forms. Shape into a flat disk; wrap in wax paper, chill in fridge 1 hour. While dough is chilling, chop chicken and vegetables, heat in triangle pots. In third pot melt butter and cook down mushrooms til browned, reducing water. Bring back up with wine. Add cream and seasonings. Leave to warm, off heat. Preheat kettle-canner on high flame. 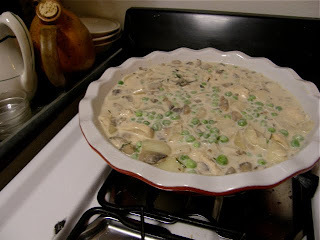 Combine chicken, vegetables and sauce in pie plate. Roll out crust on floured surface with floured rolling pin. Place over pie, trimming and sealing edges. 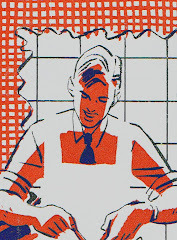 Cut trimmings into shapes if you wish; brush with beaten egg, and ventilate pie with knife-cuts in crust. Bake in kettle-canner 30 minutes until filling bubbles. Brown 5 minutes under broiler. For more on baking with the Guardian Service Kettle/Canner, check out a previous post on Devil's Food Cake.